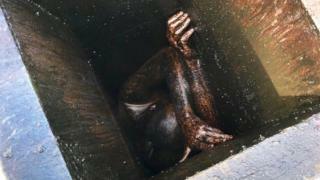 A man has been rescued after spending two days trapped in a grease vent at a vacant Chinese restaurant in California, police say. Emergency crews responded to reports of “a faint voice calling for help” from the building in the San Francisco area. The man was said to have been exhausted and suffering from dehydration, but he is expected to make a full recovery. Police say he may have been trespassing, but it is unclear whether the incident was a burglary attempt. A ladder was then used to access the roof and locate the 29-year-old man, who was unable to move despite being covered with grease and oil, the Alameda County Sheriff’s office said in a statement. It took almost an hour to “extract” the man, who was then taken to a local hospital for treatment, the statement added. An investigation is under way into whether the man was trespassing or intended to vandalise or steal from the property, police said. They added that they were “very thankful” to the firefighters “for saving this man”, who “would not have survived another day given the circumstances”.